Toronto: HarperCollins Publishers Ltd, 1999. This is the Canadian mass market paperback edition of Finding Moon. This edition was published in 1999 by HarperCollins Publishers Ltd in Toronto, Canada. The cover art replicates the cover of the first edition and was illustrated by Peter Thorpe. 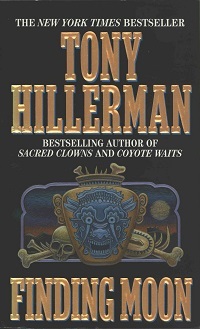 The cover proclaims, "BESTSELLING AUTHOR OF SACRED CLOWNS AND COYOTE WAITS". The back cover is an AP Newsfeatures Photo of Hillerman, copyrighted in 1993. Format: paperback, 17.1 x 10.5 cm. Binding: Full-colored paper covers with the title, image, author, and publisher's logo.